One of the problems / advantages of brick sidewalks is that they can move. It is a problem because they can become a tripping hazard. It is an advantage because, unlike concrete, brick is easy to repair. Believe me, this is not rocket science. By the time you finish reading this short article, you will be ready to tackle your first repair job with confidence. A margin trowel for slipping down between the bricks and working them loose. A mason's hammer for chipping off small pieces of brick. A dead blow hammer or rubber mallet for convincing the brick to lie flat. 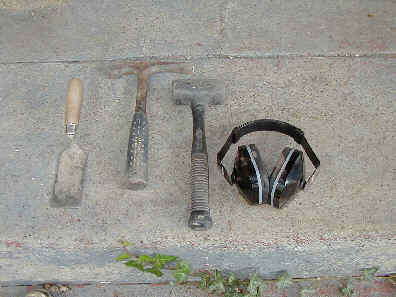 Ear protectors if you need the item in figure 2. 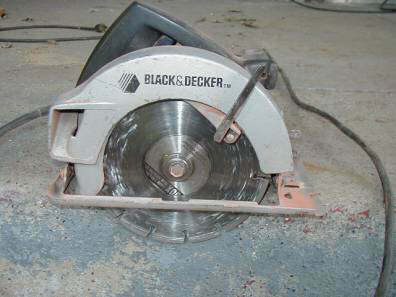 If you need to cut brick, and you probably will not, you may want to purchase a masonry blade for your circular saw. These are relatively expensive and I don't recommend it unless you really think you must have it. Like I said, you will probably not need it. Figure 3 shows a section of sidewalk that has been pushed up by a tree root. The bricks are displaced about 1/2" upward and present a tripping hazard. The first step is the most difficult; get that first brick out. That is where the margin trowel or something similar is very handy. Work it into the head joint (the short joint) at one end of a brick and lift up. It will not come all the way. You will have to go to the other end of the brick and repeat the process until you work it out. 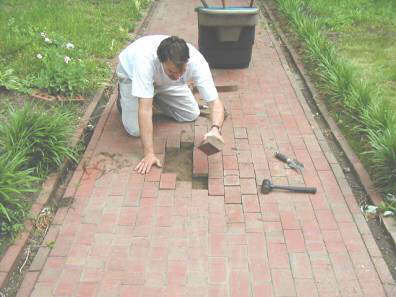 Then it is relatively easy to remove the remainder of the brick. Remove enough brick to completely expose the offending root and cut it off. 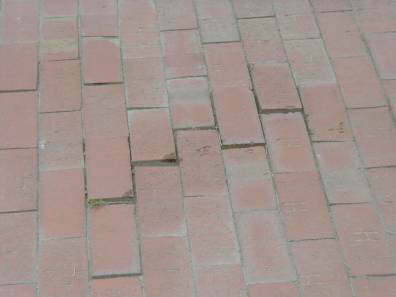 If your problem is that there is a depression in the walkway, remove all of the brick within the depression. In the process of doing all of this, you have disturbed the sand or gravel bead on which the brick rest. The next thing to do is smooth out the sand (add more if you need it) and compact it tightly. Use the flat side of one of the bricks you removed and smack the sand to compact it. If you don't, the bricks will settle and you will be doing this all over again. If the last brick in the row just will not go in, use your rubber mallet and smack the last brick on the end to tighten up the row. Sometimes this is a good idea after you have laid two or three. Sometimes it is necessary to tighten up the rows from side to side. Again, use the rubber mallet and tap them together. Be careful. You can knock the whole sidewalk out of alignment if you get to aggressive with this. These same tips work no matter what pattern you are laying. What if there is too much space when you get to the end of the row? Using your margin trowel (or whatever flat bladed instrument you are using) go back several bricks, insert it in the joint and wiggle it until the joint opens up. Try not to exceed 1/8" unless the rest of the brick joints are bigger than that. Do this between all the bricks in the row until you take up as much space as you need. How do you know if the bricks are level? 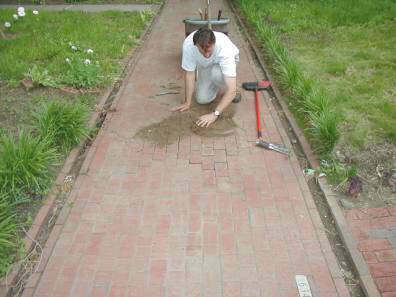 Use a straight edge that is long enough to span the entire area you are repairing. If a brick is low, remove it and place some sand under it. If the brick is high, tap it with the rubber mallet until it settles into place. If it will not settle, remove some sand from under it. What if a brick breaks? The simple answer is "forget it". I am serious. A broken brick here or there will do no harm. If it is a matter of esthetics, use the trowel to remove it and replace it. Remember this, unless you have more brick of the type used in the sidewalk, replacing the brick will be more noticeable than a broken brick. 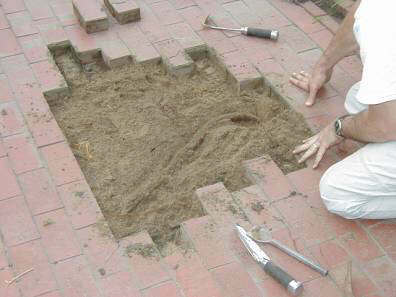 The last, but equally important step, is to fill the joints between the bricks with sand. If the area is relatively small, I like to begin by working the sand in by hand. This will usually get much more sand into the joints than just sweeping with a broom. Make sure you remove the loose sand from the sidewalk to keep people from slipping. In a day or two the original sand will settle and it will be necessary to sweep more sand into the cracks. By the way, Jed Johnson, my volunteer for this exercise, completed the work from beginning to end in 20 minutes.